Stybs has played Magic the world over, writing and drafting as part of the event coverage team and slinging Commander everywhere his decks will fit. Portland started with a cascade of players—1765 to be exact—and a cavalcade of Modern followed. Eight rounds of tournament action, with some players on their own quests and even those on their own adventures outside the tournament, tell the tale of Day 1 at Grand Prix Portland. As the story goes, the first unofficial cosplayer meet up was in Portland two years ago. It was smaller in number but not in spirit. Now, two years later, a tight-knit group of cosplayers are continuing to rally event by event. Portland, home to cosplayers like MJ Scott (@moxymtg), is close enough to Seattle, also home to cosplayers like Arielle (@AirBubbles), that it was the perfect storm. 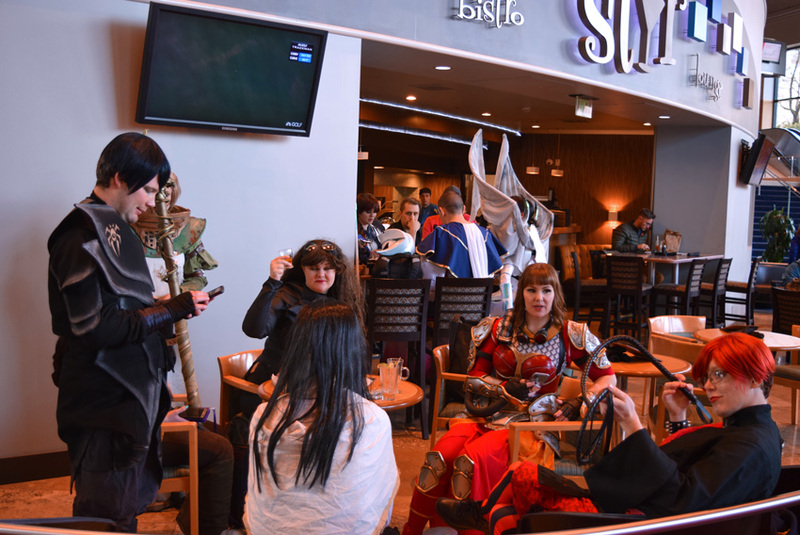 Over a dozen individuals descended together to share cosplay creativity. And try and you might you couldn't get them all into the same photo at the same time. (Adam) There's a "few" #gpportland cosplayers. "The cosplayer group chat has been around for ages," said Audrey, also known as @Oridesu. "The group has been growing." "The first Planeswalker summit was at Grand Prix Portland two year ago," Arielle added. "There's been events like Vegas and Seattle where we planned to get together." "Seattle was a planned party," said Rob, or @BibliovoreOrc. "MJ [Scott] is a creative text writer and the mastermind for all this." Ariel added. While mastermind is perhaps a bit strong—every cosplayer played their part in rallying—the effect of piling so many talents folks together was clear. MJ is among the many active cosplayers on social media, but there were many many more in attendance here in Portland. They even took over half of a dining area next to the exhibit hall. It wasn't a challenge to find someone working hard to share their love of Magic—which is exactly why they were all here at a Grand Prix. The real question is "When is the next summit?" "Portland brings back a lot of memories to me." Dana Fischer is just like every other Magic player battling in the main event. 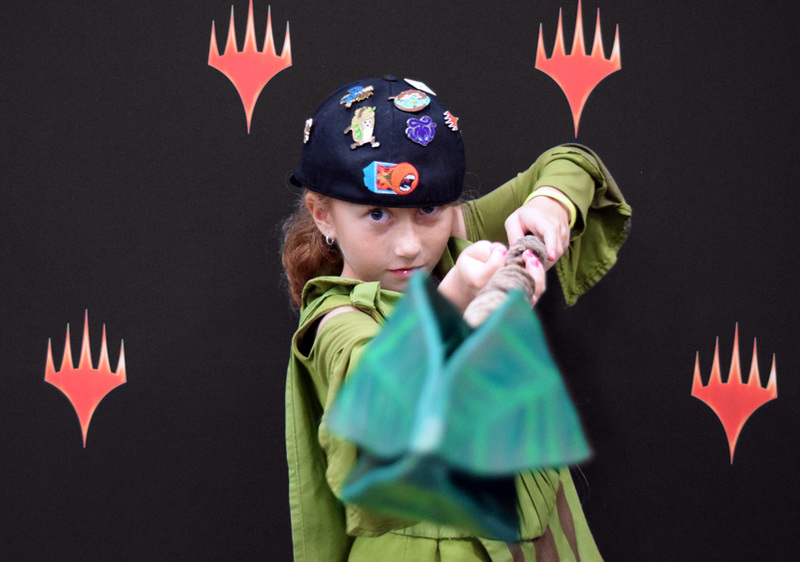 Armed with her favorite deck, one she put in the time and effort to practice, it was a quick 2-0 victory in her first match of the day to start 3-0. Having two byes and a clear goal meant Dana knew exactly what she wanted to do this weekend. Dana Fischer tapped into her Forests with one goal: Make her first Grand Prix Day 2 in Portland. Portland, of course, was a homecoming of sorts for her. She'd been to many events, but this was her third time in the same convention center. "It was my first ever Grand Prix and it's where I met a lot of people," Dana said. "Making Day 2 I think would be really special. I like having goals set out for me, and it's like goal to be the youngest player to ever Day 2." "I like setting goals for myself. It makes me feel good when I achieve the goals I set for quite awhile." And like other players, she put in the work to be ready. "I put a lot of effort in. Most of the events I've played in were Modern," Dana said. "I watched the metagame and watched Paulo Vitor Damo da Rosa's videos." "Spikes Academy," Adam Fischer, Dana's father, clarified. "He's making videos there. We also practice a lot at home too." Learning the tips and lessons of a Magic Pro Tour Hall of Fame member puts practice to work. And while Jeskai Control and Hollow One and other powerful decks are a big piece of the metagame, Dana followed the adage many Modern players know: Play the deck you know best. "I chose Elves because it's my favorite creature type and I wanted to win with it," Dand said. "But it's also the deck I have true experience with"
"You were excited about recent additions Elvish Clancaller and Assassin's Trophy," Adam said. "I saw Clancaller and I knew I wanted to play it." Dana said. "They really worked out. Having four more lords I can play really helped." After a smashing victory to start her day, Dana took two losses midday and was backed up against the ropes. But she battled right back. While Dana didn't achieve her goal, coming that close takes dedication and determination—something every player that wins learns. With sizeable 1765 player count starting Day 1 it was no surprise there was quite the scrum battling it out to remained undefeated: 23 players entered the round with a 7-0, 21 point record. This is what they were playing. Jeskai Control is... back? None went 8-0 (or even 7-0!) on Day 1. While powerful Jeskai builds are en vogue—see Jeskai Phoenix as a wrinkle on the Izzet Phoenix Modern deck—they aren't leading the way on Day 1. Tron, absent from the Trial winning lists, made an appearance. While the popularly of playing Urza's Mine and friends among players will wax and wane you can never count it out of a Modern event. Fast decks are flying at the top. Bant Spirits can disrupt and fly to victory, while Hardened Scales Affinity gets out of hand in a hurry. Both decks pressure opponents quickly and efficiently. Dredge is always squarely in the answers packed in Modern sideboards, but both the classic and newer Bridgevine versions are carrying their own on Day 1. Humans and Krark-Clan Ironworks, two of the recent Baba Yaga of the format, are here but not in the numbers we've seen at top tables before. There's still seven more rounds to make a Top 8 cut, so this story will change as Day 2 progresses, but the early look sets the stage for fast decks to dash all the way there. Eleven players ended the day with a perfect record, and every round will count on their way to the Sunday showdown.